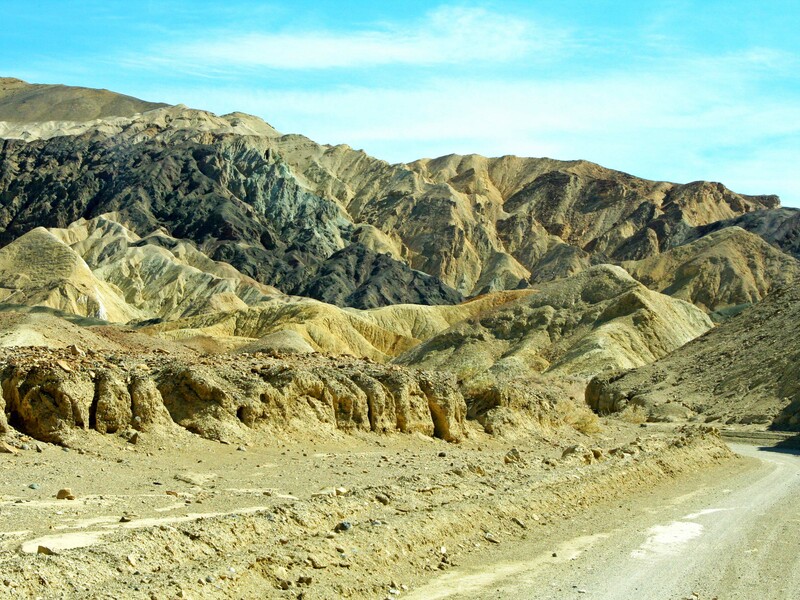 Prepare to be dazzled with a kaleidoscope of color on a drive through Twenty Mule Team Canyon in Death Valley. Various minerals are responsible for the colors. 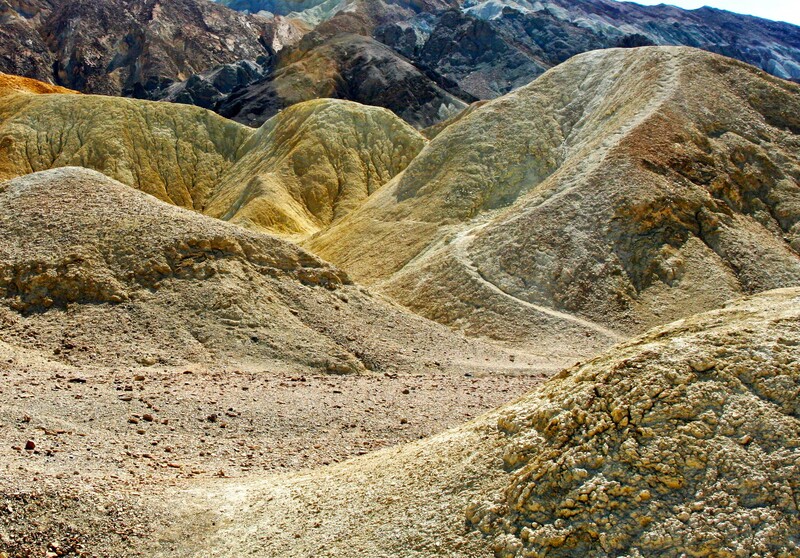 Death Valley is a land of superlatives. Think hottest, lowest, and driest place in North America. It holds the world record for heat at 134 ˚ F (57˚ C). Ground temperatures have actually been measured at 201˚ F. As for rainfall, there are years without any and the annual average is 2.36 inches (60 mm). Finally, a trip into Badwater Basin, easily reachable by car, will drop you down to 282 feet below sea level. 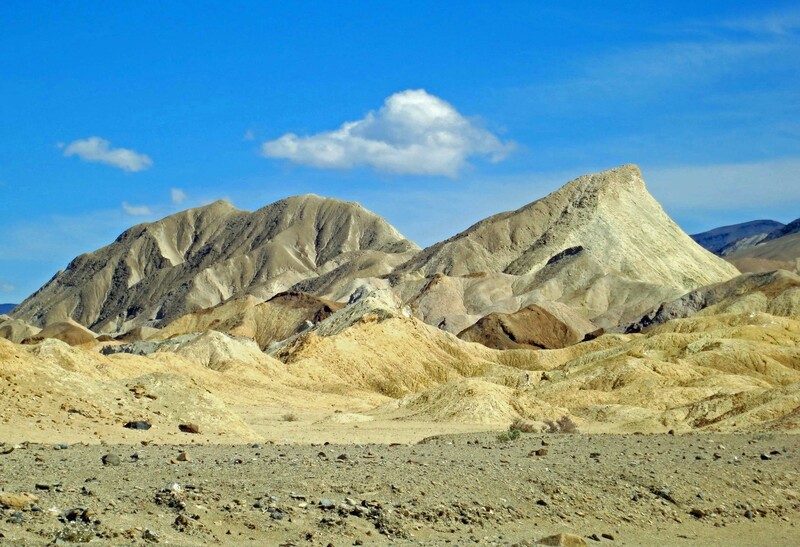 Given these extremes, a person might wish to travel to Death Valley for the sole purpose of saying he or she has been there. (Or conversely avoid Death Valley passionately.) 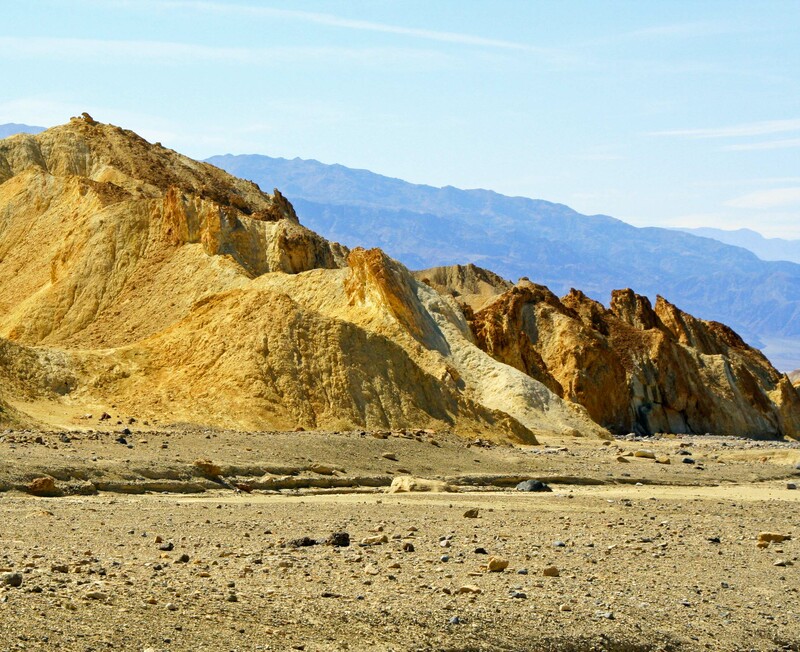 But from my perspective, the reason for visiting Death Valley is its exotic beauty. Over the past three weeks, I’ve taken you to the Valley of Fire and Red Rock Canyon. Not bad on scenery, eh? Consider it a warm up. 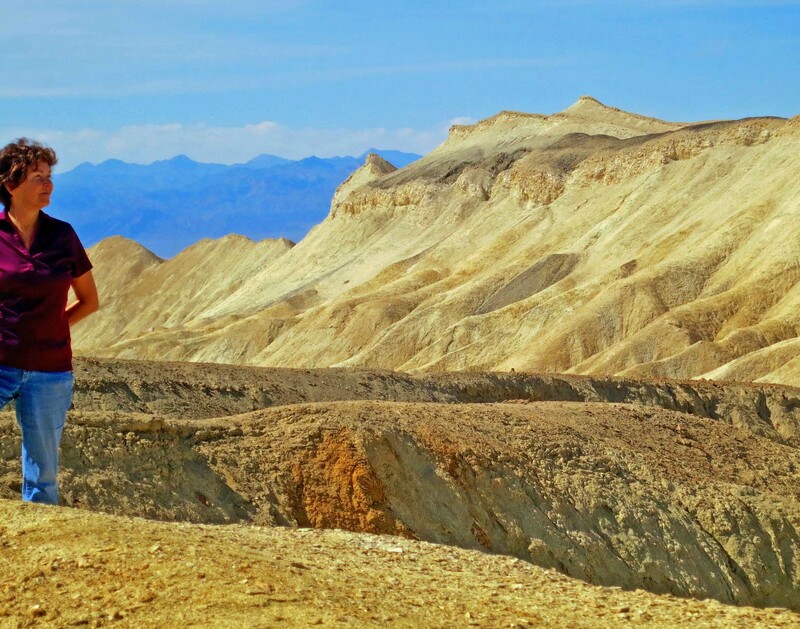 I’ve been to Death Valley numerous times and have blogged about it in the past. 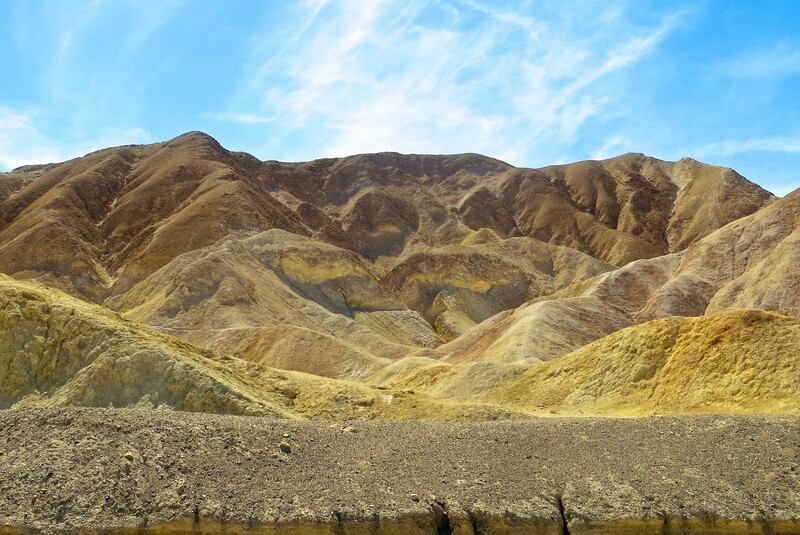 On our recent trip, we climbed out of the valley and explored other parts of the National Park including Twenty Mule Team Canyon, Dante’s View, Zabriskie Point and the unusual Charcoal Kilns high up in the Panamint Mountains. 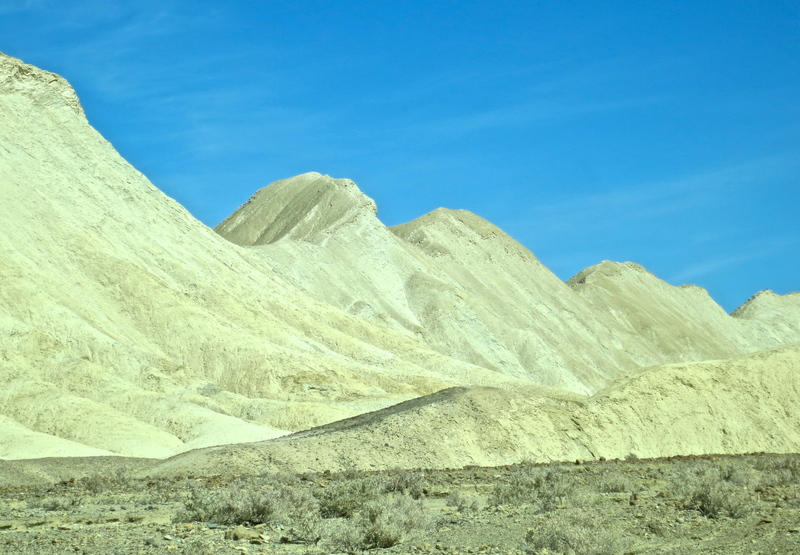 Today, we will begin our journey with a drive through the colorful badlands of Twenty Mule Team Canyon. Imagine for the moment, taking 18 mules and two horses, hitching them to a huge wagon, and hauling 10 tons of borax over desert terrain for 160 miles. 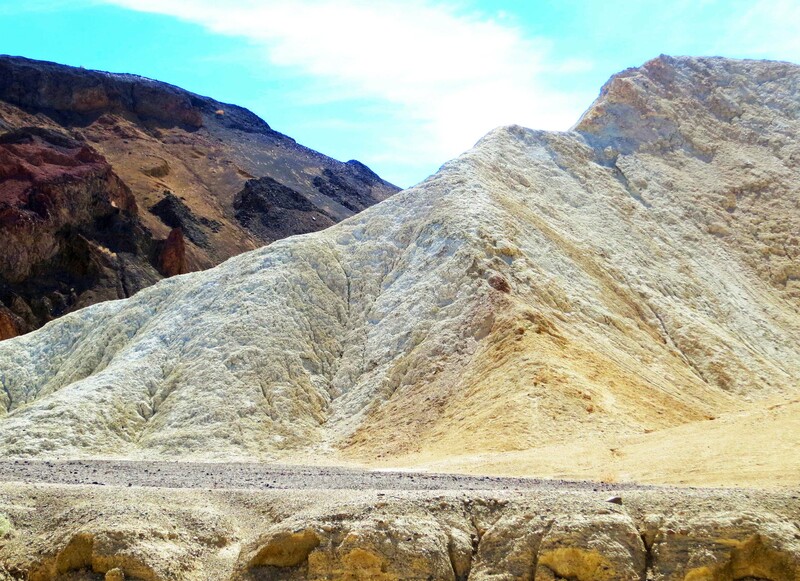 That is how borax was hauled out of Death Valley between 1883-1889 and it has become part of the local lore and legend. Francis Smith, the founder of Pacific Borax was also a first class promoter and sent his mule teams out to major cities across the US to push his soap products. At one point, they paraded down Broadway in New York City. This early, unattributed photo in the public domain, provides a view of the 20 mule team with its Death Valley backdrop. The driver had a very long bullwhip to encourage his mules along the way. The mules were eventually replaced by a steam tractor. 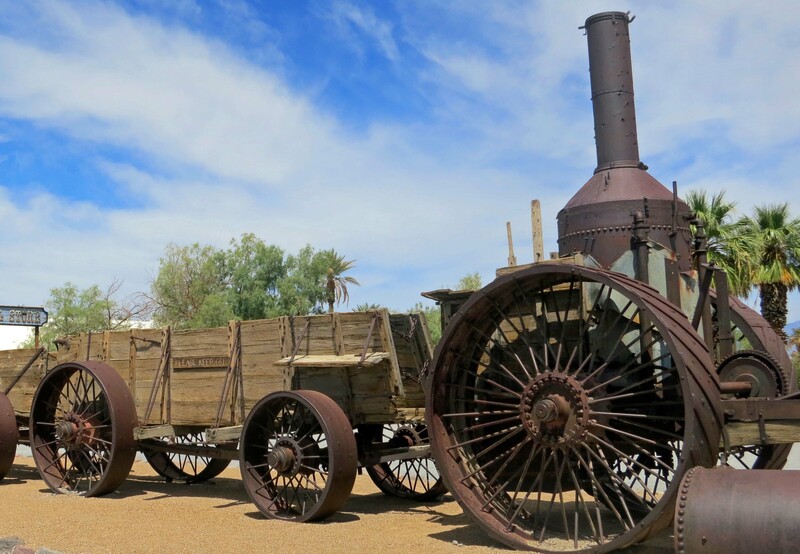 “Old Dinah” is featured at Furnace Creek. Dinah, in turn, was replaced by a railroad. Twenty Mule Team Canyon was never part of the route the mules followed. So why the name? It could have been to honor the teams but I suspect it was the bright idea of a tour agent. Whatever, no harm was done. 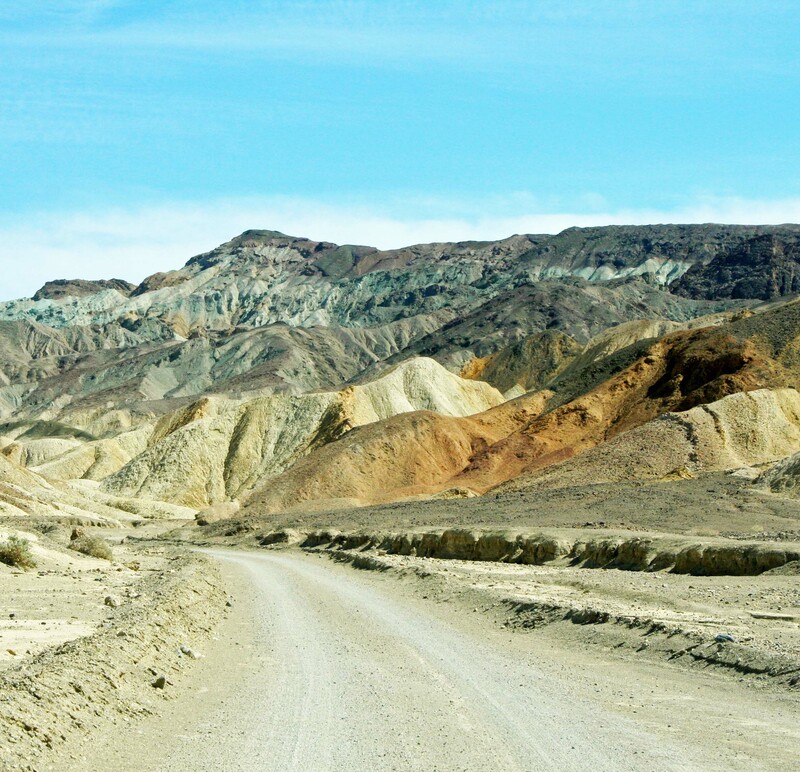 Twenty Mule Team Canyon provides a kaleidoscope of color, a laboratory of erosion, and a fun drive. I liked the effect of these contrasting light and dark colors. 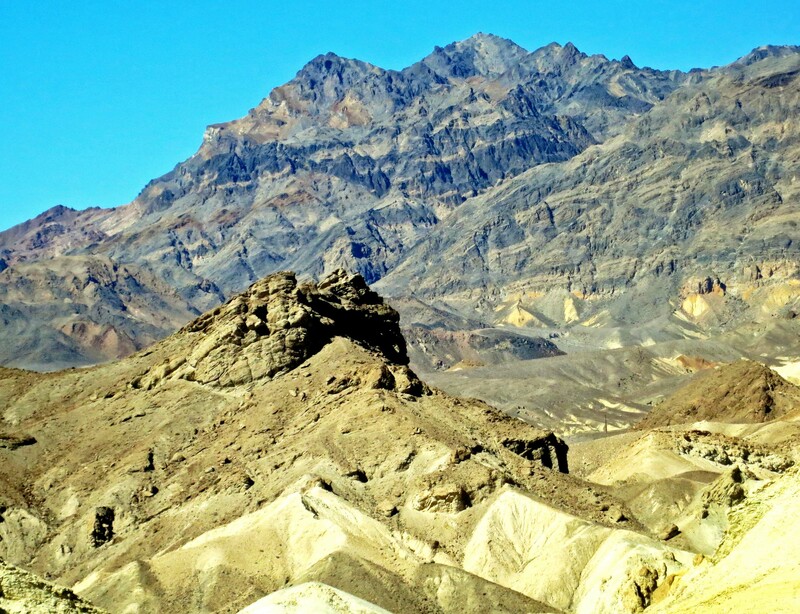 Blue skies, light clouds provide a backdrop for gold, reddish-brown and tan rocks. Mountains provide the backdrop here. These, BTW, are the Funeral Mountains. 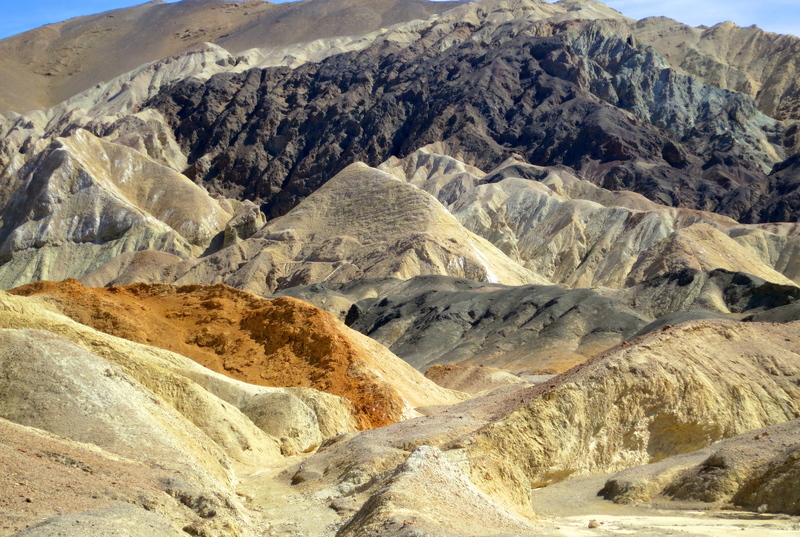 A final view of the riotous colors found in Twenty Mule Team Canyon. 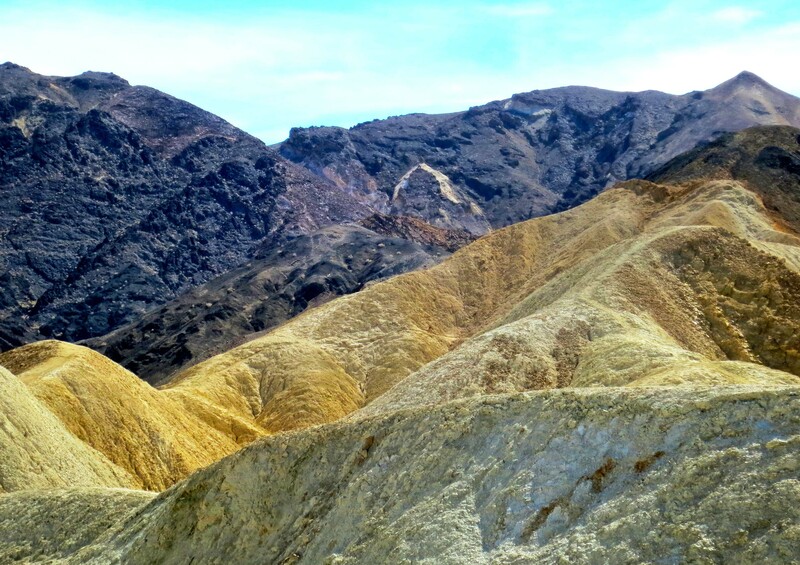 NEXT BLOG: We check out what is probably the most photographed area of Death Valley, Zabriskie Point, and climb 5000 feet above the valley to Dante’s View floor for a bird’s eye perspective.